اسکندری, سعیده, اولادی قادیکلائی, جعفر. (1396). مدل سازی گسترش آتش سوزی جنگل با استفاده از اتوماسیون سلولی. مجله آمایش جغرافیایی فضا, 7(25), 38-54. سعیده اسکندری; جعفر اولادی قادیکلائی. "مدل سازی گسترش آتش سوزی جنگل با استفاده از اتوماسیون سلولی". مجله آمایش جغرافیایی فضا, 7, 25, 1396, 38-54. اسکندری, سعیده, اولادی قادیکلائی, جعفر. (1396). 'مدل سازی گسترش آتش سوزی جنگل با استفاده از اتوماسیون سلولی', مجله آمایش جغرافیایی فضا, 7(25), pp. 38-54. اسکندری, سعیده, اولادی قادیکلائی, جعفر. مدل سازی گسترش آتش سوزی جنگل با استفاده از اتوماسیون سلولی. مجله آمایش جغرافیایی فضا, 1396; 7(25): 38-54. این تحقیق به منظور مدل‌سازی گسترش آتش‌سوزی با استفاده از مدل Alexandridis و روش اتوماسیون سلولی در بخشی از جنگل‌های بخش سه نکا-ظالمرود انجام شد. پارامترهای تأثیرگذار بر گسترش آتش-سوزی با توجه به مدل مذکور شامل ارتفاع، شیب، سرعت و جهت باد، نوع و تراکم پوشش گیاهی بودند. به منظور مدل‌سازی گسترش آتش‌سوزی و ارزیابی صحت آن، اطلاعات مورد نیاز آتش‌سوزی واقعی از قبیل نقطه شروع آتش، وسعت حریق، سرعت و جهت باد در زمان آتش‌سوزی تهیه شدند. همچنین کلیه پارامترهای تأثیرگذار برای محدوده آتش‌سوزی واقعی، در محیط GIS آماده‌سازی و کدبندی شدند. در نهایت مدل گسترش آتش‌سوزی با استفاده از روش همسایگی هشت‌تایی Moore، برنامه‌نویسی مدل Alexandridis در محیط MATLAB و فراخوانی لایه‌های رقومی کلیه پارامترهای تأثیرگذار، برای محدوده آتش‌سوزی واقعی پیاده‌سازی شد. برای پیش‌بینی گسترش آتش‌سوزی جنگل بر اساس اتوماسیون سلولی، چندین حالت سلولی و قانون انتقال آتش‌سوزی در نظر گرفته شد. با انتخاب نقطه شروع آتش‌سوزی، نمایشی پویا از گسترش جبهه آتش‌سوزی ارائه و در پایان تعداد سلول‌های سوخته و سالم مشخص شد. به منظور ارزیابی کیفی صحت مدل مورداستفاده، نتایج خروجی جهت گسترش آتش و نحوه پیش‌روی جبهه گسترش با محدوده آتش‌سوزی واقعی مورد مقایسه قرار گرفت. به منظور ارزیابی کمی صحت مدل مورداستفاده از دقت کلی و شاخص کاپا استفاده گردید. دقت کلی و شاخص کاپای بدست آمده به ترتیب برابر 88/0 و 74/0 بوده که بیان‌گر دقت پیش‌بینی مدل گسترش آتش‌سوزی و مطلوبیت روش اتوماسیون سلولی در مدل‌سازی گسترش آتش‌سوزی در تحقیق حاضر می‌باشد. This research was done to model the fire spread using Alexandridis model and cellular automata method in part of District Three of Neka Zalemroud forests. The effective factors on fire spread were elevation, slope, wind velocity and direction, vegetation type and vegetation density, based on the mentioned model (Alexandridis model). To simulate of the fire spread and evaluate its accuracy, the required data of actual fire including the fire start point, fire area, wind velocity and direction in fire time was provided. All effective parameters for actual fire confine were provided and coded in GIS. Finally the fire spread model was implemented using programming of Alexandridis model in MATLAB, regarding to Moore neighborhood and loading of digital layers of all effective parameters for actual fire confine. Some cellular situations and fire transfer rules were considered to predict the fire spread based on cellular automata method. The dynamic exhibition of the fire spread was presented by selecting the fire start point and number of burned and unburned cells was determined. Results of the model output including fire spread direction and form was compared with the actual fire confine to evaluate the accuracy of the used model qualitatively. The total precision and Kappa index were used to evaluate the accuracy of the used model quantitatively. The total precision and Kappa index were 0.88 and 0.74 respectively that it can show the precision of prediction of the fire spread model and the cellular automata method in modeling of fire spread in current research. اداره کل منابع طبیعی استان مازندران. 1390. آمار و اطلاعات آتش­سوزی در استان مازندران. یگان حفاظت اداره کل منابع طبیعی استان مازندران، ساری، 120 صفحه. اسکندری، سعیده. 1394. تحلیلی بر روش­های مدل­سازی و شبیه­سازی گسترش آتش­سوزی در جنگل­ها. فصلنامه انسان و محیط زیست، 13(3): 67-88. شرکت سهامی نکاچوب. 1389. طرح جنگلداری جنگل­های بخش سه نکا- ظالمرود. سازمان جنگل­ها مراتع و آبخیزداری کشور، اداره کل منابع طبیعی و آبخیزداری استان مازندران، ساری، 109 صفحه. عادلی، ابراهیم و علی یخکشی. 1354. حمایت جنگل. مؤسسه انتشارات و چاپ دانشگاه تهران، 279 صفحه. کاظمی، سیدمحمد. 1384. آتش و اکوسیستم­های جنگلی. دام، کشت، صنعت، 46، 56-70. محمدی، فریده. نقی شعبانیان و مهدی پورهاشمی و پرویز فاتحی. 1389. تهیه نقشه خطر آتش‌سوزی جنگل با استفاده از AHP و GIS. فصلنامه تحقیقات جنگل و صنوبر ایران، 18(4)، 569-586. ملکی، داوود. 1389. مدل­سازی توسعه شهری با استفاده از روش آتوماتای سلولی. رسالة کارشناسی ارشد، استاد راهنما: دکتر علی‌اصغر آل شیخ. دانشگاه خواجه نصیرالدین طوسی، دانشکده مهندسی نقشه‌برداری، 122 صفحه. Adab, H., Kanniah, K.D., and Solaimani, K. 2013. Modeling forest fire risk in the northeast of Iran using remote sensing and GIS techniques. Natural Hazards, 65, 1723-1743. Alexandridis, A., Vakalis, D., Siettos, C.I., and Bafas, G.V. 2008. A cellular automata model for forest fire spread prediction: The case of the wildfire that swept through Spetses Island in 1990. Applied Mathematics and Computation, 204, 191-201. Alidmat, O.Kh.A., Hassan, F.H., and Khader, A.T. 2015. cellular automata model for pedestrian evacuation in fire spreading conditions. Proceedings of the 5th International Conference on Computing and Informatics, ICOCI 2015, Istanbul, Turkey, 293-299. Bodrožic, L., Stipanicev, D., and Šeric, M. 2006. Forest fires spread modeling using cellular automata approach. M.Sc. Thesis, University of Split, Split, Croatia, 80p. Encinas, L.H., White, S.H., Rey, A.M., and Sánchez, G.R. 2007. Modelling forest fire spread using hexagonal cellular automata. Applied Mathematical Modelling, 31(6), 1213-1227. Eskandari, S., and Chuvieco, E. 2015. Fire danger assessment in Iran based on geospatial information. 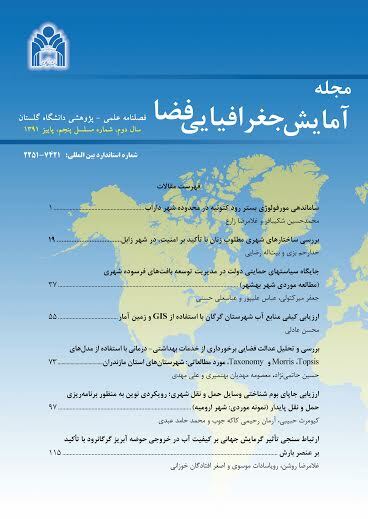 International Journal of Applied Earth Observation and Geoinformation, 42, 57-64. Eskandari, S., Oladi, J., Jalilvand, H., and Saradjian, M.R. 2013a. Role of human factors on fire occurrence in District Three of Neka Zalemroud forests- Iran. World Applied Sciences Journal, 27(9), 1146-1150. Eskandari, S., Oladi, J., Jalilvand, H., and Saradjian, M.R. 2013b. Detection of fire high-risk areas in Northern forests of Iran using Dong model. World Applied Sciences Journal, 27(6), 770-773. Ghisu, T., Arca, B., Pellizzaro, G., and Duce, P. 2015. An improved cellular automata for wildfire spread. Proceedings of International Conference on Computational Science, ICCS 2015, 51, 2287-2296. Janbaz Ghobadi, Gh., Gholizadeh, B., and Majidi Dashliburun, O. 2012. Forest fire risk zone mapping from Geographic Information System in northern forests of Iran (Case study, Golestan province). International Journal of Agriculture and Crop Sciences, 4(12), 818-824. Karafyllidis, I., and Thanailakis, A. 1997. A model for predicting forest fire spreading using cellular automata. Ecological Modelling, 99(1), 87-97. Liu, Y. 2009. Modelling urban development with Geographical Information Systems and cellular automata. CRC Press, Taylor and Francis Group, 204p. Mahdavi, A., Fallah Shamsi, S.R., and Nazari, R. 2012. Forests and rangeland’s wildfire risk zoning using GIS and AHP techniques. Caspian Journal of Environmental Sciences, 10(1), 43-52. Pastor, E., Zarate, L., Planas, E., and Analdos, J. 2003. Mathematical models and calculation systems for the study of wildland fire behavior. Progress in Energy and Combustion Science, 29, 139-153. Podur, J., Martell, D.L., and Knight, K. 2002. Statistical quality control analysis of forest fire activity in Canada. Canadian Journal of Forest Research, 32, 195-205. Roman, M.V., Azqueta, D., and Rodrigues, M. 2013. Methodological approach to assess the socio-economic vulnerability to wildfires in Spain. Forest Ecology and Management, 294, 158-165. Sirakoulis, G.C., Karafyllidis, I., and Thanailakis, A. 2005. A cellular automaton for the propagation of circular fronts and its applications. Engineering Applications of Artificial Intelligence, 18(6), 731-744. Sowmya, S.V., and Somashekar, R.K. 2010. Application of remote sensing and geographical information system in mapping forest fire risk zone at Bhadra wildlife sanctuary, India. Journal of Environmental Biology, 31(6), 969-974. Trunfio, G.A. 2004. Predicting wildfire spreading through a hexagonal cellular automata model. In: Sloot., P.M.A., Chopard., B., Hoekstra, A.G. (Eds.). Cellular Automata. Springer Verlag, Heidelberg, Berlin, Germany, 385-394. Vakalis, D., Sarimveis, H., Kiranoudis, C.T., Alexandridis, A. and Bafas, G.V. 2004. A GIS based operational system for wildland fire crisis management, I. Mathematical modelling and simulation. Applied Mathematical Modelling, 28(4), 389-410.